One of the features highly desired but natively absent from Blackboard 9.1 is an attendance roster. As SUNY Jamestown Community College transitions from Angel to Blackboard, faculty are noticing the absence of this prized features. Here is a workaround to the problem using a Google spreadsheet. Log into your Blackboard course. Open the Grade Center -> Full Grade Center. Select Download from the Work Offline drop-down menu. Copy file to a Google Drive folder. Begin a new Google spreadsheet. Give the spreadsheet a name. Choose your uploaded CSV file and click Select button. Make necessary adjustments to your spreadsheet. Return to your Blackboard course. Mouse over the “+” sign on the upper left corner of your course, and select Web Link. Leave Available to users unchecked. 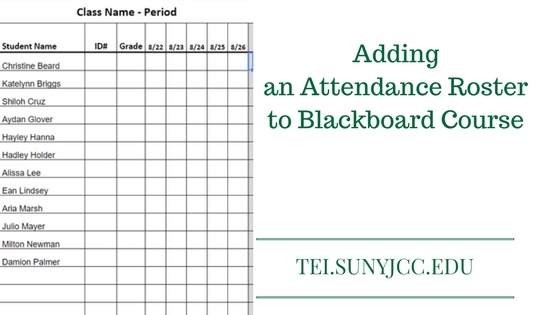 You now have an attendance roster available from your Blackboard course. If you have suggestions for improving this idea, please add them to the comments below. also, please share ideas that you use for solving this problem.